B-D Safe-Clip - Easy Enough for kids to use. Needles can be dangerous and need to be safely disposed of safely. 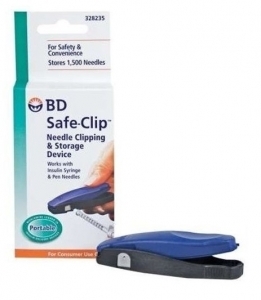 The B-D insulin syringe needle clipper cuts off the needle from an insulin syringe and stores the needle safely inside the clipper. Small in size, it can store up to two years worth of needles.